Shut Up and Color - Enova International, Inc. Being human is distracting. A constant influx of stimuli from our bodies and the world outside continuously jostles for our limited attention. Our minds have developed powerful neural pathways —called default pathways — to help us focus our attention, but these pathways are mostly geared towards helping us concentrate on physical activities, a relic of our hunter-gatherer past. When modern knowledge workers sit at their computer all day, these attention pathways start to atrophy, making it increasingly difficult to focus. Fortunately, there’s a fix. As I recently discussed as part of Enova’s Tech Talk series, there are a number of activities anyone can do at the office to keep the brain primed for concentration and creativity. These include using an acupressure ring to stimulate the nerves in the fingers, molding Play-Doh and getting up for a little light exercise. The simplest, however, is also among the most effective: doodling! Gabriela Goldschmidt, an expert in linkography — the study of the design process — agrees, saying that doodling opens a “dialog between the mind and the hand holding a pencil and the eyes that perceive the marks on paper.” This translates into any sort of writing or drawing. Sketching designs, for instance, can directly lead to new ideas and new paradigms of thought in the design. If one imagines a design as a tree of possible outcomes, sketching creates new branches that would otherwise be unexplored. Similarly, coders can jog their creativity by jotting down ideas in a notebook or drawing mockups of what they want the final product to look like. 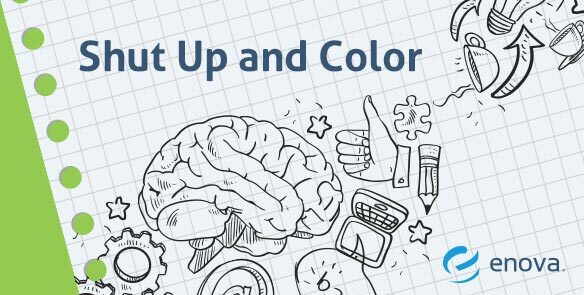 So next time you’re feeling like you can’t focus on anything, take my advice: Shut Up and Color!